It’s no secret amongst those who know me that I’m a huge lover of the works of Disney and Pixar. This also makes me a vocal critic of their lesser efforts. I’ve no hesitance in saying that both companies have had their share of duds—Pixar with two in a row as of late with the disappointing Brave and the soulless Cars 2. When a prequel was announced to Monsters Inc. in the form of Monsters University, I found myself disappointed due to Pixar’s apparently failing once again to strive for the original storytelling they’re known for, and instead relying on a popular property to make bank off of, similarly to what they did with Cars 2. Now I’m glad to report that University is a follow-up closer to Toy Story 2 in quality after all. 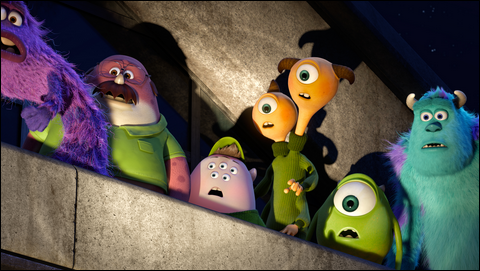 The film places Mike Wazowski (Billy Crystal) and James “Sully” Sullivan (John Goodman) back into the spotlight—this time as students at the titular Monsters University. Mike lacks the physical attributes to be a frightening creature, and has compensated by studying the notably intricate techniques that go into a successful scaring. Sully, on the other hand, comes from a legacy of renowned scarers, and was blessed with an intimidating demeanor that he has failed to back up with the proper skill. Jealous of one another’s talents, the two immediately bash heads, leading them to suspension from their scare class. Forced into a fraternity of losers, the two have to compensate for what they lack whilst becoming the friends we know from the sequel to make the grade. Monsters University has the great animation you’d come to expect from a Pixar film, and some of the humor too (especially visual comedy). It’s entertaining and there are some great moments, but overall, it’s a weaker effort compared to its predecessors. All of your obligatory college jokes are here, but it did spare us egregious references to Animal House, so there’s that. However, having said this, the feature deserves praise for actually being a strong prequel. Instead of diminishing its predecessor, it actually enriches the original film the way this one fleshes out the universe. This, as well as twists in the narrative, makes up for the moments of running through the motions. Due to the premise of the film, there’s a level of predictability you expect going into it. And in a lot of ways, as I’ve pointed out, you’d be right. Maybe it’s due to lowered expectations, but I found myself respecting the movie for the turns it took with the story. University delivers with a strong message for kids: You can’t always be what you want to be, no matter how bad you want it. Some people are born with opportunities that we can’t hope to attain, but we all have something unique that we can contribute with, albeit with a lot of hard work. While the movie delivers its theme with a subtlety you’d expect from a kids’ product, it’s still very well. Despite shortcomings and moments that don’t hit the mark, Monsters University passes with flying colors when it comes to delivering the heart you’d hope for in a Pixar film.